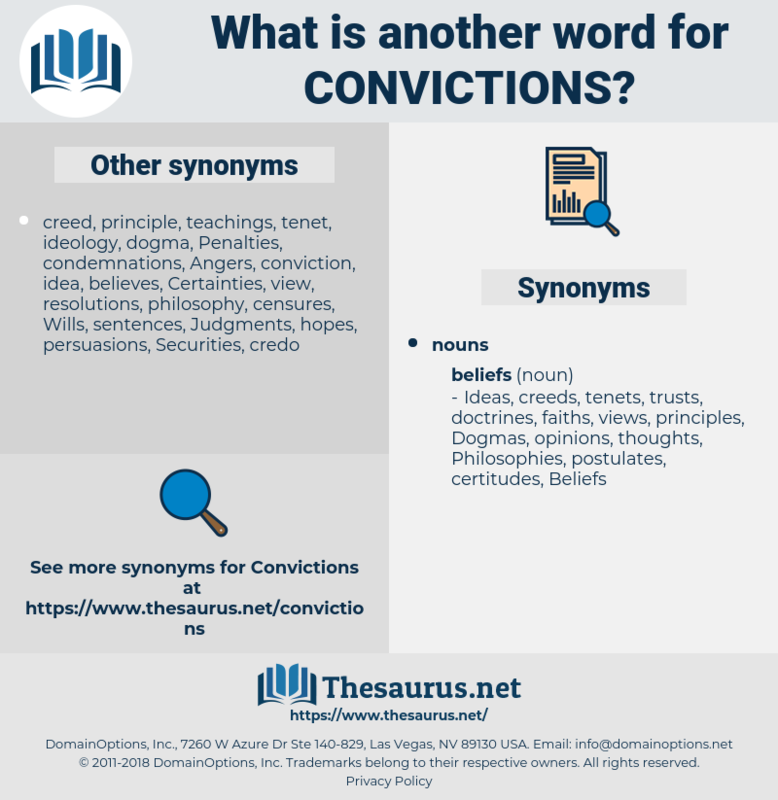 What is another word for convictions? litigation, proceedings, Prosecuting, prosecute, prosecutorial, convicted. 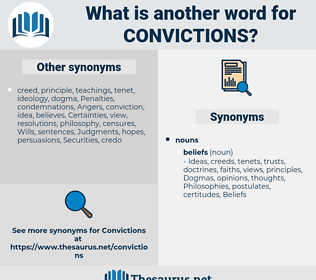 executions, contraventions, accusations, conceptions, considerations, violations, interpretations, indictments, notions, opinions, Perceptions, decisions, trials, sanctions, offences, infractions, condemned, allegations, defendants, vision, Visions, denunciations, ambitions, denominations, minds, condemns, concepts, positions, principles, counts, Religions, viewpoints, offenders, fines, faith, faiths, prisoners, pleas, doctrines, infringements, inmates, offenses, precedents, instances, terms, Sentiments, Cops, Punishments, Voices, incidents, malfunctions, appeals, sanctioning, suspects, Crimes, judges, perpetrators, shortcomings, traffickers, motives, offending, magistrates, Certainties, perspectives, provisions, writings, pronouncements, insights, statements, transgressors, occasions, recordings, thoughts, culprits, stances, standpoints, believers, times, Persons, Charges, values, Sensibilities, teachings, assurances, judicial, antecedents, Records, grounds, jugements, tenets, prosecutors, civil, ideologies, views, Policing, followers, strongly, luck, breaches, failings, judiciaires, decrees, priors, premises, guts, cases, headings, chances, Attitudes, police, Histories, choices, faults, Deficiencies, civilian, clauses, creeds, ideals, Deemed, exhibits, failures, ties, backgrounds, mistakes, lapses, Been, Strikes, virgin, people, pas, weaknesses, defects, flaws, awards, Ideas, balls, writers, Traps, FIDE, bugs, requests, fe, feelings, figures, convicted. convict, convicts, courts, verdicts, Penalties, persuasions, rulings, condemn, prosecutions. His deeply religious convictions were impressed. I believed what you told me, and so I knew what I ought to do; but I struggled against my convictions. compaction, composition, combustion, confection, confiscation, convocation, convection.